Kiranpreet Multani is a trusted and diligent family physician and primary care doctor serving the community of San Antonio, TX. Dr. Multani attended Michigan State University, where she received her medical degree, and completed her internship and residency at Oakwood Annapolis Hospital. Dr. Multani is a part of MedFirst Legacy Oaks and is affiliated with Saint Luke's Baptist Hospital in San Antonio, TX. She is certified by the American Board of Family Medicine and is also a member of the American Academy of Family Physicians. Dr. Multani is trilingual in English, Punjabi, and Hindi. 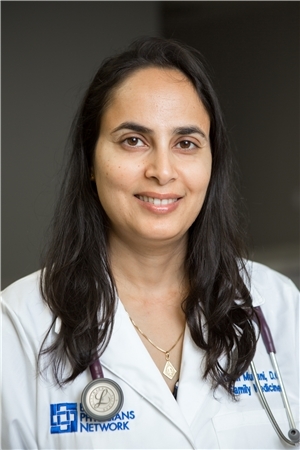 Dr. Multani is sensitive to the uniqueness of each patient's situation and adapts her consultations and treatment options appropriately to accommodate individual needs and concerns. During her consultations, Dr. Multani fully explains patients’ conditions and helps them choose an appropriate treatment plan. I have seen her twice so far. I used to see her because could get the appointment very quick. I agree with someone who left the review, she appeared very rude and condescending. My last appointment was done in 5 minand I could see she was ready to move on. She does not connect with patients at all. If you want to just get medicine, sure she is great. But if you want someone to call your doctor, she is not that person. I was a regular patient at Dr. Multani's as booking appointments were easy and relatively painless, however I do not think I am coming back here again. Dr. Multani has been consistently condescending and rude in office. She does NOT listenand repeatedly asked the same questions regarding medication history many times (within a five minute span). She also stated some inaccurate facts regarding medication and their side effects. As a current medical student, it was rather worrisome to me and made me lose my trust in her as my physician. Excellent experience. Love the text remiders. No wait in the lobby. Patient's portal that contains all my information. Dr. Kiranpreet was very nice and explained well what was expected to happen. Nurse and staff were nice and caring. Dr. Multani is very kind and listens to your concerns. The only thing she does not do is prescribe any type of controlled substances ie. Alprazolam, Adderall ect. Courteous, professional and extremely thorough with my examination. Answered all my questions. Very pleased with my first visit. Very pleasant staff and dr.
She was amazing: Polite, kind, and very knowledgeable! She was very caring and interested in understanding my health history and very observant about my need for various tests to have done so she can better understand exactly what needs to be done to improve my overall health. My visit was very pleasant, flawless actually, everybody was very friendly and professional. I didn't wait long for anything the doctor was very sharp, smart, professional, and pretty, with just enough humor to offset how stoic and roboticdoctors can be. We clicked immediately, we had the perfect doctor patient chemistry I felt that I could trust her and that she cared about my well being. Apparently I hit the jackpot bc she is a DO as well! I would highly recommend, this doctor, the office location was great, and ZocDoc, to find a doctor or specialist. Dr. Multani was very nice and compassionate. I was very nervous about my visit due to my illness, but she assured me that it would all be taken care of. She gave good advice and provided multiple options for recommendations. Shealso took the time to explain in detail anything I did not understand when it came to the reason for my visit. I was so impressed with how quickly I was seen. Also with the way Dr. Multani listened to everything I was feeling and she took action on everything . I will not be changing doctors anymore! it was a good visit best doctor ive seen in a while.will definetly go back to her. Dr. Multani was kind and patient, she made sure we understood whatever matters we were discussing and ensured our needs were cared for. I tried several different doctors after moving to San Antonio and am so glad I found Dr. Multani. She is fast, attentive, and no-nonsense (in the best way possible). The office moves quickly and efficiently. I sent my husband to herafter my own great visit and he agreed that she was the best we've seen here in San Antonio. Very good. Answered my questions. Dr. Multani was easy to talk to and her bedside manner was great. She listen and gave me feed back. I look forward to being her being my primary care Physician. She was very thorough and and took her time with me. The staff was very pleasant as well. Very professional. Willing to listen and address my concerns. I have been in search for a great PCP and I do believe that I finally found her!! I want to thank Dr. Multani for her patience and professionalism. Dr. Multani took the time to listen to my health concerns thatI am currently experiencing and did not try and herd me out of the office so that she could go onto the next patient. Kuddos to her staff as well. Totally impressed with the whole package, that being said, yes I will be returning! Dr. Multani was great. Very nice. Dr. Multani was very kind, listened and gave thoughtful advice. She was very thorough and spent time with both my son and I.
Dr. Multani was kind, knowledgeable and took the time to listen to my concerns. In highly recommend her. I absolutely love Dr. Multani. She is caring, a great listener, and does an outstanding job in helping. Her staff is amazing. I made quite a few phone calls before I finally got a Dr's office where the staff ACTUALLY called me back to schedule a visit with a Primary Care Physician after my ER visit. I don't know how other businesses arethriving.. but I digress....... Dr. Multani is wonderful. She listened to my woes, asked several questions to make sure she got to the heart of my issue (it's complicated) and immediately set me on a course of action that's manageable. I have already been to a few Dr's and I can say that they were not nearly as thorough as she was. Not by a long shot. I've already recommended her to a friend looking for a PCP and am considering transferring my daughter to her care as well. Her staff is very professional, I felt comfortable talking to her and that means a lot to me. Dr. Multani is very professional and takes the time to understand what your case may be. Wonderful! Everyone was caring and kind. They even took me in before my scheduled appointment! Wonderful office. It was great .she is very professional and thorough. Office staff was courteous, knowledgeable and very informative. Dr. Multani listened to my concerns and provided a plan of actions. I'm happy with my first visit. SHORT WAIT TIME AND SWEET AND HOMELY STAFF!!! She is spending good time to understand the health condition. Nice way of explanation about our question. I loved it, Doc Multani very professional and nice. Definitely making her my primacy care doctor as well as my husband. I love the fact that they called me by my Married name :-) thank you! Everyone was friendly. Wait time was minimal even for additional procedures. Dr. Multani was generally concerned about my health and took excellent care of me. Highly recommend! Everyone is so nice. I am extremely happy that I found Dr. Multani, she is awesome! Very professional and nice. She was very helpful! I was looking for a PCD when I went to the recommended Dr. Multani. I was pleased with her and her support staff. She was able to give me referrals to spcialist that I requested. I feel confident that I finally found my PCD. She is a very caring dr. And i know that she will take care of me. At least now i have a dr. That cares. If i would have known about your office sooner i would have come to you allsooner. I feel like you all are mu family. So ty for everything. Will be back next month. Visit was fine, but the follow up events afterward were not great. I had a follow up appointment scheduled and I missed it (I do understand that this was my fault), but I was never told either in-person or via emailor text that I would then be fined a fee. I also was asked to schedule a lab test, which I did, and once the test was completed I never heard anything back from the office about it being good or bad. I called almost 4 weeks later around 12pm (my lunch break) to find out the results and the doctor had a call service relay the message that I should call back "during normal business hours" to get the results from the front desk. When I called back later that day, the front desk said they had already told me my lab results 3 weeks ago and that the date was recorded - I told them that no one had called me and they were confused by this. All around, just not a great experience, would not recommend to a friend. She was very attentive and really listened to what I said. She offered many solutions to my problem. Dr. Kiranpreet Multani, DO has no appointments on Zocdoc right now.